2 wheel and 4 wheel drive rolling road chassis dyno test cell has the potential to run to 200mph with 1200 wheel horsepower handling. 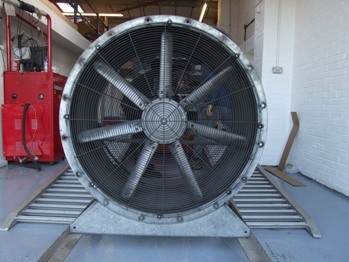 Huge cooling fan capable of moving 33000 cubic feet of air per minute. Power and torque at wheels, power and torque at flywheel, air fuel ratio, air intake temperature, ambient temperature, barometric pressure, boost pressure, road speed. 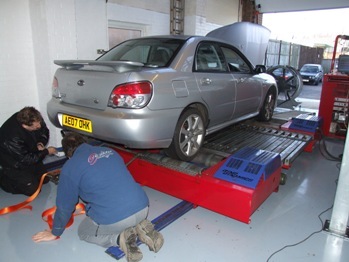 We invested in our Dyno Dynamics 4WD rolling road so that we could create the best possible performance upgrades safely and legally and have the ability to live remap ECU's in house. 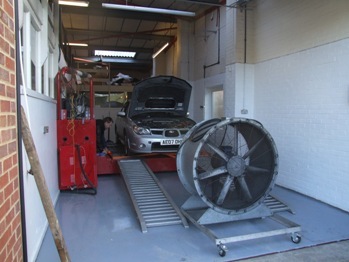 The Dyno has the ability to hold load which allows us to precision tune an engine. The rolling road also serves as an excellent diagnostic and data logging tool. 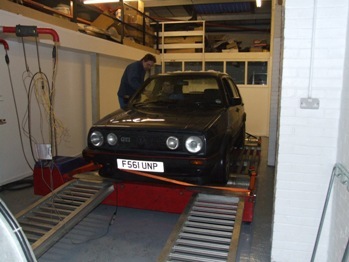 This is a trusted dyno dynamics quality 4WD Rolling Road dyno. 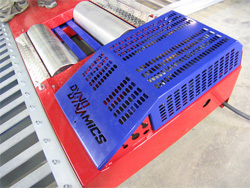 The Dyno Dynamics 4WD rolling road is regarded as being one of the most accurate chassis dyno's in the world. They have now become the industry standard. 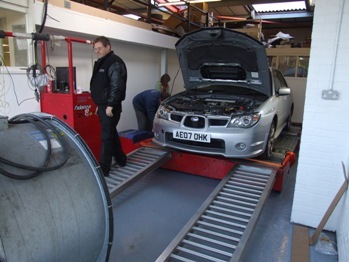 An independant testing of 4WD rolling roads by Performance Tuner Magazine put the Dyno Dynamics Rolling Road as the most accurate. 2) Eliminate tyre slip on the rollers with the unique roller and strap-down design. 6) ShootOut mode allows for accurate results that are comparable worldwide as it eliminates any possibility of manipulating horsepower figures. Shoot-Out mode was developed by Dyno Dynamics primarily to eliminate "Operator Technique" and as a tool for measuring horsepower accurately and CONSISTENTLY for ALL Dyno Dynamics 2WD and 4WD Rolling Road dynos" (so no more wondering whether the results have been "fixed"). Our rolling road is just perfect as an advanced diagnostics tool and data such as Power, Torque, Boost Pressure, Air Fuel Ratio etc. can all be logged and at the end you'll receive print out showing all these values. The charge for this is just £50 + VAT Ring for block booking/group buy. Remapping 4WD rolling road sessions can be booked in conjunction with the regular visits by a remapper. The charge for a rolling road remapping session is £75 + VAT per hour (excluding the remapping, see the remapping page for charges). 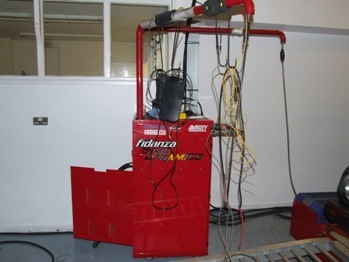 We provide a fully trained Dyno operator and access to the machine, including sensors and data software. If you book a rolling road remapping session and remapping with us on a pre announced mapping day then you receive a 10% discount on the 4WD rolling road session. If you have a already booked with your own mapper then why not meet him at our rolling road? Mappers, ring for hire prices and block booking. Front & rear rollers linked No (fully independent). • Power, tractive effort, speed,Air:Fuel/lambda etc.